Everyone is running, whether you're the fastest or the slowest. Life is all about running, but no matter what, there are something that you cannot run from. Barry goes full nerd talking about zombies. Iris thinks he's the cutest nerd still, but she doesn't really see him. Iris turns their talk to the Streak, and goes all Lois Lane about him. She's totally digging the metahuman with no clue that he's they guy in love with her standing right next to her. She tries to show him a picture someone took of the Streak, but Eddie calls, ruining everything. He's pretty, but he's definitely no Barry. Barry gets a call of his own. Cisco bumbles the codes, but Caitlin clarifies, bad man with a gun is getting away. It's time for the Streak to speed into action. Barry runs off without a word to Iris, and no supersuit in sight. The said bad man is trying to allude the police and taking shots at them. Without so much as a snarky comment, Barry handcuffs and throws the guy in the back of the squad car,and makes it back before Iris even notices he was gone. Barry asks if she wants to get a bite, since he's famished, though it seems that he's already eaten plenty. A family is having a very showy dinner for a power display, but they're about to get more than they bargained for. The windows may have been replaced with bulletproof glass, but the door is locked, and the key broken in the lock. Things are about to go down. In the mob roundtable, there is a thief in their mix. As the Uncle talks about the thieves drawing their last breath he chokes on his and the green smoke filling their lungs. The nephew tries to shoot out the windows and get some fresh air as everyone is choked out by the latest bad metahuman, but those pesky bulletproof windows don't give. The cops are all abuzz about the latest easy arrest thanks to the Streak, not that he's getting any credit for it. Joe suspects it was Barry, and he's right. He's not in it for the glory, but keeping the secret is way harder than he thought possible. Joe knows, but its safer that way. For now, they have work. Joe presents Barry with the evidence of Barry's mother's case. Joe wants to pour over every scrap again, now that he believes Barry completely. But that's going to have to wait, as Eddie arrives with news of the crime family's demise. At the scene Barry finds that the family was gassed, but he'll need a lung sample to be sure. All exits were blocked, with the theory that gas was pumped in from outside, but witnesses say that the the street was empty. It was from the inside, so there had to be a canister left behind. Barry muses unless the gas had a mind of its own. Joe sends Eddie out to search some more, while Barry tells Joe his theory. Looks like they've picked up the metahuman angle. Cisco wonders if its just poison gas, or all gas, and Caitlin tries to figure out how he manipulates it all. Wells geeks out with the the pair. Joe points out that their current prison isn't exactly equip with handling metahuman, so unless they plan to kill all the ones they encounter they need to come up with something. Wells tries to think of a way to contain their powers. Cisco knows of one place that could, which instills Caitlin with fear. Of course, he's talking of the particle accelerator. Nine months ago. Wells is giving his speech about the advancements that his particle accelerator will bring, the bright future it'll usher in, as Caitlin beams by his side. Cisco reports on the big storm coming in, but Wells thinks it will all be fine. Caitlin and Ronnie talk about their honeymoon locations as the accelerator becomes ready to launch. Wells feels like he's been waiting for this day for centuries. He starts up the machine, and its all quiet, which is a good thing Ronnie points out. Wells pops the champagne cork to celebrate, and things get weird. The liquid floats out, and then falls, followed by a loud noise. Wells pulls Caitlin out of her memories. She didn't hear him say that he was going down to the accelerator ring. Barry also notices, and tells Wells that he needs her help to identify the gas. She thankful for the excuse not to go, and Wells doesn't try to deter her. Barry welcomes her to the CCPD, and its all business. Everyone wants something from Barry, he's a very in demand guy. The Captain asks Barry about some labs, and he runs off to get them, leaving Caitlin to trail behind. Barry speeds to gather the analysis, and has it as Caitlin arrives with Captain Singh. He delivers the fiber analysis, and the guy remarks about the messy conditions of the lab. Joe watches video of Barry's father telling of the events that took place the night Barry's mother was killed. To a normal person it does sound crazy. Barry's father was adamant that he was trying to save his wife. Joe turns off the video as Iris comes downstairs. He plays it off as a misfiled case. Eddie arrives, and tries to lie about the real reason that he's there. If Joe doesn't put together the pieces soon, I'm going to seriously question his detective skills. Eddie is a horrible liar. Eddie claims he was looking for Joe, and he wants to recanvas the last crime scene. Joe buys it. Eddie asks to use the bathroom, while Joe heads to the car. He's had enough of the secrecy. He came to surprise Iris and now he's off to a crimescene with her father. Iris still doesn't feel like its the right time. She thinks that her dad will kill them, but he points out that she's the one killing them. Cisco and Wells takes a look at the accelerator. There are a few changes that will need to be made, but it may just do it. Past. Cisco found that there was an anomaly in the chamber, but Caitlin pointed out that the structural integrity was holding of the moment. Wells tells them that they need to shut it down, but the only way to do it Cisco says is manually. As the lead engineer Ronnie heads to help out. At the door, Ronnie tells Cisco that if he isn't back to initiate the lockdown, but Cisco knows that once he closes the doors they won't reopen. If he doesn't close them everyone will die. He puts two minutes on his watch, and waits as long as he can before he has to close the doors. The past haunts Cisco too. Wells knows how hard it must be to come back down there. A lot happened that night, Wells offers to be a sympathetic ear. Cisco talks calculations rather than feelings, one fault could be catastrophic. Barry asks Caitlin if he can ask a question she doesn't have to answer. Caitlin agrees. Barry asks about Ronnie, since she doesn't talk much about him. Ronnie and she were very different. Caitlin is guarded, but Ronnie was laid back, he knew how to make her laugh. He use to say they were like Fire and Ice. He wasn't suppose to be there the night of the accident. He was there for Caitlin, and she feels the blame. The test comes back, there was no gas found in the tissue, but two different strands of DNA were. Caitlin and Barry take a closer look to see how some one else's DNA got inside of the victim's lungs. A woman walks through the mall chatting on the phone with her daughter, she's being watched and followed. Barry didn't find any hits on the DNA, when Barry wonders what if the person they're looking for doesn't control gas, but become it. The woman enters an elevator, when the man catches up to her. She recognizes him, thinks that he died. He reminds her of her last words to him before he was to die, and then he turns into gas, and floods the elevator. She struggles to get free. Barry and Caitlin hear the call come in on the scanner. Barry is ready to spring to action, as Caitlin tells him not to go, that its not safe, but Barry is a hero and he has to go. Barry races towards the mall. Cisco has already found the location of the victim, and Wells helps to navigate him there. In the mall, security tries to control the growing crowd. The woman is already dead when Barry arrives on scene. He does a quick scan to see if he can find the culprit, and he sees the gas turning into a man. The Flash catches up to him, asking why he killed that woman. There is still one more name on his list. Barry takes a swing at him, but fighting a man who can turn into gas, turns out to be a little difficult. He goes all gassy and permeates Barry's lungs. Cisco sees that Barry is still alive, but his vitals are low. Barry heads back to STAR Labs, gasping for air. Cisco runs for help. With Barry on the table, Wells tells Caitlin that he has an active gas sample in his lungs. Caitlin can extract it, but she can't give him any anesthetic, and its gonna hurt. Barry tells her to do it anyways. Barry wakes, the Streak lives. Caitlin chastises him. If his lung cells didn't regenerate so quickly he'd be dead. His chest feel like the one time he has a cigarette. Caitlin doesn't appreciate his jokes. Wells tells him that they'll analyze the sample, and try to find a way to stop him from changing forms. Cisco dubs him as the Mist. Barry plans to get to the station. Wells thinks he should be resting, but Barry needs to talk to Joe. Barry tells Joe that the metahuman isn't controlling toxins, he is the toxin. Joe doesn't like the sound. He tells him that the victim was a judge, they're going through the old cases to find the connection. Barry blames himself for not being fast enough, but Joe tells him not to blame himself. Barry is thinking about his father being in prison for a crime that he didn't commit. He couldn't save his mother, but he will save his father. Joe promised he would help free him, and he intends to keep it. Barry reminds him that he could go and take his father and no one would see him. Joe asks what he would do after he broke him out of jail. He would be on the run all his life, and he's not as fast as Barry. He's been a cop longer than Barry has been alive, and Barry putting on the suit doesn't solve everything. There's lots of guilt over what is done sometimes, and sometimes more about what isn't, or when a mistake is made. Some things you can't fight, some things you just have to live with. Eddie takes a call about a Streak sighting at the mall as Iris arrives. She overhears it, and she asks if they got a good look. He can't believe his ears. She asks if they can talk, and Eddie assumes that its bad news. He is her father's partner, and it would be awkward. Iris stops him. She's never had a serious boyfriend, her life has been full. She really likes Eddie, and telling her father makes things real, like something she could lose or screw up. Eddie wanted it to be real. Iris pulls him back, kisses him. Barry apologizes for scaring Caitlin. She understands he had to go, but he said the same thing Ronnie said to her before she saw him for the last time that night. Barry admits that when his mother died he thought distance would make it better, but some days it hurts more than the day he lost her. Some things you can't fight. For so long, Caitlin was terrified to go down below. Barry offers to go down with her. She faces the reactor doors, the thing that stood between her and Ronnie. The night of the accident, Caitlin raced towards Ronnie, to find the doors already shut. Cisco couldn't open them, they were on lock down. Ronnie gives Cisco directions on what to do, he' tells him to adjust the magnets to redirect the beams so the blast goes up not out. Cisco moves to complete the task. Caitlin pleads with Ronnie to get out of there. There is no way out for Ronnie, he has to keep the doors shut to protect her and everyone else. Joe is headed to see Henry Allen. Barry calls to Eddie. Joe isn't picking up his cell. Barry tells him that its really important to get a hold of Joe. Eddie admits that Joe went to see Barry's father. Caitlin gives Barry the antidote that she's concocted to counteract the Mists gas. She hopes that he won't need it. Henry comes out to see Joe, and takes his seat on the other side of the glass. He's not exactly happy to see the man who raised his son. Joe never came to visit, and Henry is more than a little upset about it. Joe tells him he's sorry he never came, but he's here now because he knows Henry didn't murder his wife. Barry races towards the prison. Cisco is pretty sure he can figure out how to break Barry in, but there's no need. Barry has been plotting how to break in since he was 11. Joe tells him that new evidence has come into light. He can't give him any details, but the case has been reopened. He promises to get him out, and he's so sorry. Henry tells him that it doesn't matter because he always believed in his son. Gas fills the room suddenly, taking out the guard. Joe gets up to investigate. Nimbus turns from gas into himself. Joe recognizes him, thought he was dead. Nimbus intents to kill Joe. The gas goes into Joe's lungs as Henry calls for help. The rest of the Mist heads up and out of the vents. The Streak arrives, and injects Joe. He blurs his face so that his father cannot see him. Joe begins breathing again, he tells Barry to go get him. Outside of the prison, Barry catches up to him. Nimbus taunts him, asking if he intends to do what the gas chamber didn't. Barry is ready to kill him. Nimbus turns himself into a wall of gas. Caitlin realizes that Barry used the antidote on Joe, and warns him to stay away from Nimbus, not to breathe him in. The gas charges, and Barry darts away. Barry rushes Nimbus when he solidifies. He needs something more than just a warning. Caitlin thinks that he should try to wear him out. Wells reminds him that gas is the most unstable shape, and that he will need to solidify. Barry uses his speed to keep Nimbus as the Mist. He stays just out of reach, and Nimbus solidifies for a moment, before striking as gas again. Staying as gas is taking its toll, and Nimbus is soon wiped. Barry knocks Nimbus down. They win. In the hospital, Joe wakes up. It's been a while since he watched Barry sleep. Barry admits that rescuing him is exhausting. He could have gotten his dad out tonight, but he sees that Joe is right, that it isn't the way. Iris rushes in for a hug, with Eddie with her. Barry leaves to let Iris talk. Joe notices that Eddie arrived at the same time as Iris. Iris is ready to make a confession, but Joe already knew. He's a detective, and they're lousy liars. He's mad, but he's gunless. Eddie leaves them alone to talk, and so he can look into witness protection. Joe tells Iris that this makes things complicated, but since she likes him, he'll do his best not to shoot him. Wells, Cisco, and Caitlin watch Nimbus as he tries to break out of his make-shift metahuman prison. He can't get free even in his gas form. Caitlin isn't comfortable housing all of them, but Wells knows that people can get use to almost anything. Cisco asks to talk to Caitlin for a moment. Caitlin stops him. She's okay. She thought that coming down would undo her, but thinking about what Ronnie did just makes her love him more. She needs ice cream or a drink now. Barry tells his father that Joe will be okay. He admits to his father that he's been thinking of his mother a lot, he misses her. Henry tells his son about when Barry learned to walk. He was a late walker, but his mother wasn't worried. She said he would walk when he had some place to be. And sure enough, when he took his first steps, he ran. Barry ran straight to her. He had some place to go. 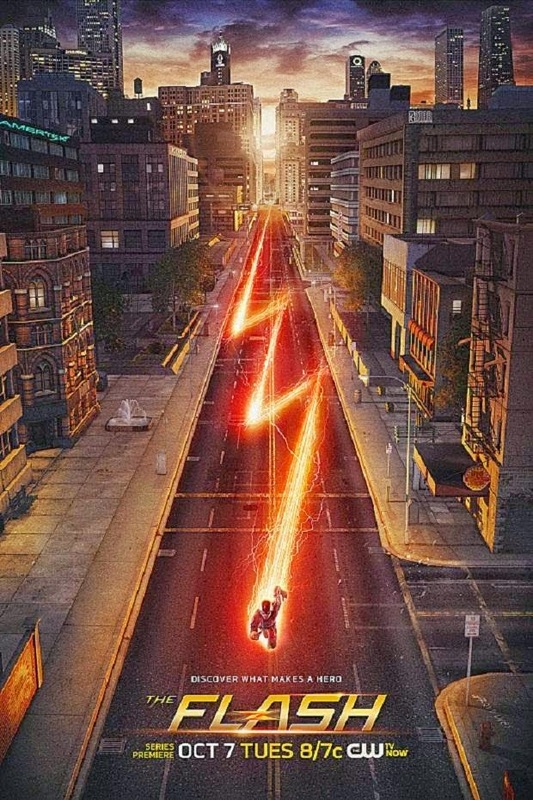 Barry thought being the fastest man alive would make his life easier, that he could outrun anything, but he was wrong. You can't outrun pain. Life is tragic, but its also precious. It's sweet and extraordinary. The only way he knows how to honor his mother's life is to keep running. Wells has a drink as he looks at the Flash suit. Past. Cisco calls to Wells and tells him that Ronnie did it, the lab would hold. Wells tells him that he's on his way down, but he heads into his secret room. He watches on a screen as Barry gets struck by lightening, and knows that he will see him soon.